Satin silver stripes on voile look oh so dapper with a bright purple reverse. 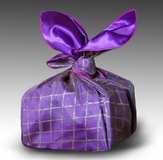 Wrap a gift or stylishly wrap your lunch! Black velvet dots on organza reverse to a rich purple charmeuse satin. Sparkling lattice organza reverses to a rich purple satin. Silvery organza with sparkles reverses to a majestic purple amethyst.